Clever, kind-hearted Kubo (Art Parkinson, 'Game of Thrones', 'Dracula Untold') ekes out a humble living, telling stories to the people of his seaside town. Each day, the villagers gather round to hear young Kubo’s tales illustrated with bewitched origami figures that dance and come to life when he plays his magical two-string shamisen. Transfixed by his lyrical tales and colourful flying figurines, the townspeople always beg for one more story before he hurries home to his mother at sunset. One day, Kubo ignores his mother’s warnings and stays out at night. His relatively quiet existence is shattered when he accidentally summons a spirit from his past which storms down from the heavens to enforce an age-old vendetta. Now on the run, Kubo joins forces with unlikely companions Monkey (Charlize Theron) and Beetle (Matthew McCounaghey), setting out on a thrilling quest to save his family and solve the mystery of his fallen father, the greatest Samurai Warrior the world has ever known. The 'Kubo And The Two Strings' competition has now closed. Winners will be announced shortly. Competition opens at 5pm AEDT on Sunday 27th November 2016 and closes at 11:59pm AEDT on Sunday 4th December 2016. Five winners will be chosen at random on Monday 5th December 2016. To successfully win, entrants must fulfil the above entry conditions before the time the competition closes. Current members/followers are eligible to enter the competition. Only one entry per person. Only one winner per household. To be a valid winner, the entrant must not have won a prize from SWITCH within the last 28 days. Each winner will receive one Blu-ray copy of 'Kubo And The Two Strings'. By entering, you agree to receive occasional emails from SWITCH in the future. If you decide to unsubscribe from these updates, any further entries will not be applicable. Only Australian residents are eligible to enter. 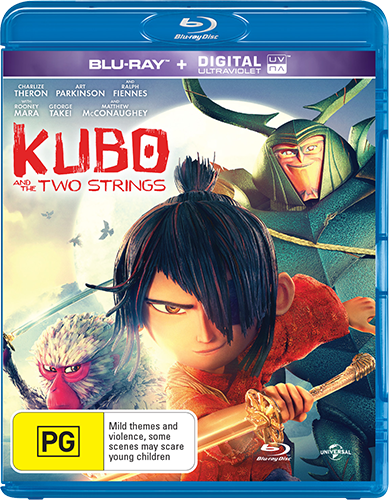 'Kubo And The Two Strings' is available on 3D Blu-ray, Blu-ray and DVD on Wednesday the 30th November 2016 from Universal Sony.